A national favorite. The Sweet Pea (Lathyrus odoratusis) is native to the eastern Mediterranean. It was a major specialist crop in Britain until it fell out of fashion and the skills needed to grow it on a commercial level were lost with the change in taste. It is now making a well deserved resurgence and is being grown by a small number of boutique flower farmers such as ourselves. They acquired their name from the sweet scent that emanates from these most delightful of climbing annuals. 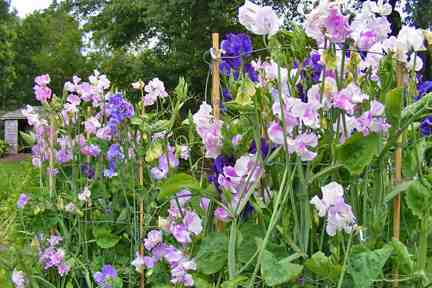 Availability in a myriad of colours combined with a long vase life makes the sweet pea the Queen of the Annuals. She is however a viperous monach and her peas or flowers should never be ingested for fear one may collapse in the conservatory and become a ‘bit part’ in a Miss Marple tale. Being that the Higgledy Garden gets the sharp end of winter out here in East Anglia, we tend to leave planting until the spring. In milder climbs some folk sow them in October. Though having said we may give some a head start in the greenhouse and the cold frames and we’ll see how we do. The First Cut Flower? English Cut Flowers. Which is the best? Oh, god – I’ve just realised my question about your readers may have come across as “what’s in it for me?” which is not a motive I would ever resort to. Was just trying to be funny. (Is that what the young people call an “epic fail”?) I’m thrilled to be asked and am certainly not looking for any payback or free advertising. Hope you didn’t think that. My blog stats are roughly the same as yours – sometimes, suddenly, a couple of hundred people find it, I don’t know how, and sometimes it’s just a handful of, I suspect, friends. I have no idea how many are returning visitors as I don’t know how to work that out. In fact, could I pick your brain about that sort of thing sometime? Aw thank you Jan! I didn’t think for a minute your motives were less than pure. So excited by “boutique flower farmer” btw – am getting my business cards reprinted immediately. How would you feel about being a guest blogger on Higgledy and giving us an article on your wedding flowers…obviously making links back to jw blooms? It wouldn’t matter if it were a rehashed one from something you’ve already done. The Blog is only a few weeks old and at best gets 100 visits a day and at worst 10! 65% are returning visitors. The graph is steadily rising…(we appear number 11 in the google rankings for ‘English Cut Flowers’ already!!! )I appreciate your goading!!! I’m not too worried about numbers just yet as I’m still finding the blog’s identity…I thought perhaps I was trying to be too funny and should concentrate on accurate information on cut flowers…but to be honest that will just bore me and the posts that I have tried feel somewhat lifeless. With regard to your guest bloging I will make a link to it in my category section under weddings (We’re not contemplating weddings for a while) Any wedding leads we get we’re happy to pass on to you. Though our internet presence is small our ‘real’ presence in our locality is very healthy, with five good and solid outlets wishing to take our produce come the spring…probs as much as we can produce in our small garden. Our blog site will be on the label of every bunch that goes out. PS How many do you get at JW Blooms?